While changing a sentence from Direct form of speech to Indirect form of speech or vice versa following points are to be observed. In Direct form of speech there is a statement within the inverted commas made by the speaker usually addressed to the person whom it is addressed. There is a reported speech inside the inverted commas and reporting speech outside inverted commas. A sentence generally has a Subject, an Object & a Verb. A Subject or an object are usually denoted by a Noun or a Pronoun. These are represented by three forms of persons i.e. First Person, Second Person & Third Person. First Person is the person who is speaking or is making the statement. First Person Singular — I , My , Me. First Person Plural —– We , Our , Us. Second Person is the person to whom the speaker is addressing or to whom the statement is being told. Second Person Singular & Plural —– You , Your , You . Third Person is the person except above two categories referred in the statement or about whom reference is made in the speech. Third Person Singular —- He , His , Him OR She , Her , Her . Third Person Plural —– They , Their , Them . B. The second type of interrogative sentences are which start with words like – What,Which, Why, Who,Whose,Where,When, How and Whom etc. Inverted commas are replaced by ‘if or whether’ in case of first type (A) of sentences but in case of second type of sentences (B), no word is written in place of inverted commas. The interrogative sentence in the reported speech will be changed into simple or assertive form of sentence. You is second person and it will change according to the subject i.e. ‘me’. It will be ‘I’ ‘Have ‘ is first form of verb and it will change into second form of verb i.e. ‘had’. ‘my’ is first person and it will change according to Subject i,e, ‘the stranger’ which is third person singular i.e. equivalent to ‘He’. So ‘my’ has its equivalent in third person ‘his’. The stranger inquired of me whether I had ever been to his village earlier. said to = asked or inquired of Inverted commas will be removed without substituting any word. How you feel now. Why you are not taking your medicine regularly. The first sentence in its indirect form will be : how he felt then. Second Sentence : you = he are not taking = was not taking your = his. The doctor asked the patient how he felt then and why he was not taking his medicine regularly. The doctor inquired of the patient how he felt then and why he was not taking his medicine regularly. The old lady said to her son 2. why you are so late from your office today. 3. You have taken your meals or not. 4. Why you did not inform me about it during the day. The old lady asked her son why he was so late from his office that day and if he had taken his meals or not. She further inquired of him why he had not informed her about it during the day. Here are some similar sentences for practice. Change the following sentences from direct into indirect form of speech. The old man asked the young man if he had not warned him time and again against his treacherous behavior. The young lady asked the beggar why he did not do some work and if he did not feel ashamed of begging. The policeman asked the passerby if he had seen which way the thief had fled. My friend asked me if she had invited me to her marriage party the next Sunday. Her brother asked her if she was coming to his house that night to attend the party. The student asked madam if she would help him in solving that problem. The shopkeeper asked the customer if he should get delivered all of those articles at his place. The priest said to the visitor if he could not wait for the hermit till next day morning. 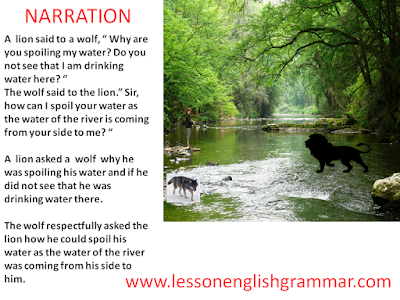 The lion asked the wolf why he was spoiling his water and if he should not punish him for that fault. The guest asked the host if there was a person who would fetch him a glass of water. I am very happy to see your article. Please let me know what I can do for you. It’ll be my pleasure if I am of any help to any of our readers.Do continue viewing and recommend to others to view. But do not miss to give your suggestions/ views to give you better material. Thanks for your positive and encouraging comments.